BRANTFORD – Holocaust survivor and educator Pinchas Gutter will speak at Wilfrid Laurier University’s Brantford campus on March 9. Gutter, a native of Lodz, Poland, was seven years old when the war broke out in 1939 and is one of only four cousins in his family who survived the Holocaust. Gutter and his family fled to safety in Warsaw, Poland, but were then incarcerated in the Warsaw Ghetto for three and a half years. The family was then deported to an extermination camp in Majdanek, where Gutter’s father, mother and twin sister were killed. Towards the end of the war, Gutter was forced on a death march from Germany to the Theresienstadt concentration camp in Czechoslovakia. 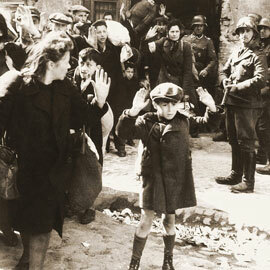 He was liberated by the Soviets on May 8, 1945 and was taken to Britain with other children for rehabilitation. Gutter is married to Dorothy Gelcer, with whom he has three children and three grandchildren. After the war, Gutter lived in South Africa for many years and then immigrated to Canada. He divides his time between speaking about the Holocaust and volunteering as a chaplain. Gutter is also an honorary full-time cantor in the Kiever Synagogue and an educator with the Sarah and Chaim Neuberger Holocaust Education Centre in Toronto. The event, sponsored by the Faculty of Liberal Arts and History program, will be held on March 9 from 1 p.m. to 2:30 p.m. on Laurier’s Brantford campus in room RCE 004 during the HI124 History Detectives class. The event is free and open to the public.